Given the chicanery of the Finance-Media-Military-Industrial-Complex, FMMIC, its important that; humanity recaptures that process of deliberation & action called community, corporations & government. The Both-Sides-Now, Equal-Time, Recorded & Published 'Debate' (French 'de' = 'undo' + 'bate' = 'the-fight') method considers human action & decision-making to be based in processes of contrast & comparing data from multiple perspectives. Human attention & resources are captured in deliberation priorities. Government deliberations are meant to be 'dialectic' ('consideration of both or all sides'). When governments are bought & paid-for by special interests, preoccupied with making perpetual war & unresponsive to basic human interests at home & abroad, it's up to citizens everywhere to side-step government dysfunction & recapture public attention & responsible action, by other means. Humanity's original Indigenous ancestors & peoples from everyplace on earth hold council whereby opposing points of view would be given structured time and opportunity to express within the interested circle of witnessing friends, family, colleagues, neighbours, Production Societies, Extended multihome buildings, Villages, nations and confederacies. This universal 'dialectic' ('both-sides') right and obligation/responsibility ensured that all citizens were first responsible to engage people, conflict, research, and issues verbally with equal time given to each. The council circle formed multiple witnessing and in the diverse memories of each witness, a recording way of engaging multiple perspectives. Dialectics are originally the foundation of media (once a responsibility for healthy reporting), education (origin of Socrates 'academia'), interpersonal relations, family, profession and community. Target: End government, media, military-industrial complex use of Social Media for 'hates' ('1984' by George Orwell). Starting dialectic campaigns. ILLEGAL US WARS IN IRAQ & AFGHANISTAN: No weapons of Mass-Destruction (declared US mission for invasion) in Iraq & no Afghani's in 9/11 (US declared mission for invasion). Bradley Manning as Intelligence Personnel in the US army came across systematic repetitive atrocities on the part of the US Army in Iraq. According to his duties towards the US Constitution, Bradley released these documents, videos etc to Wiki-leaks. The full, previously unreleased audio recording of Private First Class Bradley Manning’s speech to the military court in Ft. Meade about his motivations for leaking over 700,000 government documents to WikiLeaks. In addition, we have published highlights from Manning’s statement to the court. While unofficial transcripts of this statement are available, this marks the first time the American public has heard the actual voice of Manning. Total time 1 hour 8 minutes. Spread these links as widely as possible. Manning faces some of exact same charges I faced forty two years ago when I leaked the Pentagon Papers to the New York Times and eighteen other papers. The only difference is I was a civilian, so I could stay out of jail on bond while the trial was going on, and was able to talk to the media throughout. I took responsibility for what I had done on the day of my arrest, and I was able to explain why I did it. But thanks to the judge's rulings in Manning's case, the public has barely heard anything from Manning at all. No official transcripts of the proceeding are released to the public, and when documents like the judge's court orders are released, it is weeks after the fact - and only in response to a Freedom of Information Act lawsuit. Now I hope the American people can see Manning in a different light. In 1971, I was able to give the media my side of the story, and it is long overdue Manning is able to do the same. As Manning has now done, I stipulated as to all the facts for which I was accused. And I did that for several reasons, and I suspect that Manning had the same motives. Can I share with you a concern about Care2 and other Social Media?The governments of the USA, Canada and other NATO countries are using Social Media in the same way George Orwell forecast in his classic 1984. Orwell was writing from his perspective having witnessed the British government funded social and economic 'hate' programs against Nazi Germany of World War Two. Orwell could see how easily the English people descended into intense hate for the German, Austrian, Italian, Romanian, Japanese and other Axis nationals. Today these same mono-lectic hate campaigns through carefully orchestrated Social Media are being used by resource hungry governments with xenophobic agendas to muster popular support in order to arm rebels to destroy Afghanistan, Iraq, bomb Libya and other campaigns in a false "Arab spring". Israel, the USA, Canada in this order are the three highest armament, component and security industry producers per capita on the planet. Other NATO countries follow closely and every military nation on earth now has some devoted web presence. Military personnel and armament industry employees are being instructed / hired to spend part and even all of their days in spreading their messages of xenophobic war producing hate on social media. When ever there is a war going on somewhere on the planet, it is providing jobs and profits for those nations who make war their business. Social Media can be used to support dialectic, two sided dialogue discussions / 'debates' (French 'de' = 'undo' + 'bate' = 'the fight') among differing parties. Our Sustainable Development Corporation and Indigene Community www.indigenecommunity.info use a method called Both Sides Now, equal time recorded dialogues as a simplified easy to use method in our community building work. Care2 is welcome to use this letter or any of our materials to take Social Media from monologues to dialogues between opposing sides. https://sites.google.com/site/indigenecommunity/structure/1-both-sides-now-article Dialogue is the 'truth-search' Satyagraha path to peace. Please follow the following Link to Libya Gaddafi and Libya's Green Movement. These facts are supported by many statements made by Libyans and by international observers. We know the media and governments are lying when they only present one side of any story. Since the beginning of Al Qaeda's occupation of some areas, Gaddafi called for international observers and even troops to intervene and verify for themselves. He openly called for international mediation. All these open offers were ignored by Canada, USA and NATO and Al Qaeda in Libya. And now Syria http://www.commondreams.org/video/2012/02/08 Pepe Escobar from Asian Times US will continue to arm anti-government mostly foreign mercenaries & some rebels in Syria after veto. Russia and China not wanting another repeat of Libya bombardment, regime-change and assassination have vetoed UN resolutions for intervention. 7 February 2012. I would rather just be focusing my attention on enhancing the wonderful abundance of the natural world at my doorstep and human ability to live in harmony through abundance and friendship. The human heritage of ‘indigenous’ (Latin = ‘self-generating’) abundance and friendship is told in the Indigene Community website. Humanity has entered a new phase just this last month of March 2011, predicted by George Orwell in his book 1984, in which a conjuncture of electronic social, mainstream, alternative and national-intelligence-service media have developed unprecedented social infiltration. Depressing media continually fills the attention of minds to instil continual passive non-involvement. In the third world this mind - penetration through social and other media is being exploited for immediate negative impact such as massive street mobilizations, violence and forced change of government. Facebook and other social media by convening messages of ‘hate’ (negative dissent) have attained a popular outreach in circulated messages, orchestrated by foreign national intelligence for our own self-serving purposes. The ability to bring down anygovernment within weeks is eminently received by our press. It will seem threatening to us for the violent anarchy created, when our own peace and security is at risk. The focus of these ‘hates’ http://en.wikipedia.org/wiki/Two_Minutes_Hate as first described by Orwell from his own experiences in Britain during the 2nd World War against the Axis and following during the cold war against the Soviets, is to channel human technological society inspired anxiety against perceived enemies and reinforce support of technological regime. The same angst we are feeling here is also felt worldwide through our imposed media, ownership and lifestyle control. For most of us it is a numbness, not of sharing to make community work but a seeking of isolation from the storm. http://www.youtube.com/watch?v=8y06NSBBRtY&feature=related Dwight Eisenhower in 1961 at the end of his eight year presidency and role as United States military chief of staff and allies supreme general takes a step of warning the US nation about the unprecedented influence of the military industrial complex in the creation of perpetual war. Libya is only one more step of media-led indignation, manufactured dissent or what Israel’s Moshe Dayan once reached for as “Operation Justified Vengeance”. 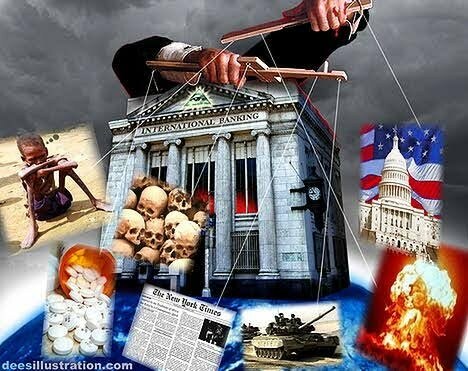 Western gluttony of world resources and energy is maintained by well financed intelligence networks in constant implantation, arming or destabilization of 3rd world governments. Our extreme daily dependence upon oil (mostly the automobile), jet transport, nuclear, coal, hydro, corn-fuel and energy intense lifestyle for both necessities and constant lifestyle distraction is putting pressures on ecologies, economies, foreign populations and their governments to constantly be in war readiness for western pleasures. Libya is governed by or reaching for a form of direct democracy described in the Green Book. https://docs.google.com/viewer?url=http://911-truth.net/other-books/Muammar-Qaddafi-Green-Book-Eng.pdf&pli=1 The attached documents may surprise you considering what our corporate press and government officials are feeding us. Few are probably aware that in the middle of March 2011 less than a month ago, Saif Al Islam Gaddafi, Muammar Gaddafi’s second eldest son, invited NATO forces and the USA to “occupy eastern Libya” where most of Libya’s dissent has arisen. Saif had confidence that NATO and the USA would see for themselves the aggression of the Al Qaeda militants in those areas and be convinced in Libya’s cause. Let us suppose however that as in every nation on earth, the rebels have at least some just cause as does the Libyan government. How can this diversity of perspectives find common cause? Following are links to 14 internationally respected voices familiar with Libya who have been to Libya and interacted with Muammar Gaddafi and the majority of Libyans come away with a positive view of Libya’s Green movement, opposite to what our western Media including most internet social media sources are reporting. My own views are simply a distillation of what I have heard from both sides and hatred for violence along with analysis based on following the money. 11.The Truth About Mercenaries in Libya http://www.youtube.com/watch?v=42lZyIMkSns&feature=related Al Jazeera News is racist media against Black Libyan people. Muammar Gaddafi supported and employed Black people in Libya. Arabs carry hatred, prejudice and superiority against black. 16. Nick Turse Describes the Real Vietnam War in an interview by Bill Moyers BillMoyers.com PRO 8 Feb. 2013 https://vimeo.com/59211983 Turse, who devoted 12 years to tracking down the true story of Vietnam, unlocked secret troves of documents, interviewed officials and veterans -- including many accused of war atrocities -- and traveled throughout the Vietnamese countryside talking with eyewitnesses to create his book, Kill Anything That Moves: The Real American War in Vietnam. Humanity’s long universal international ‘Indigenous’ (Latin = ‘self-generating’) heritage holds deep comprehensive traditions of peace which have been the mainstay of human history on earth before the present period. The Indigenous Circle of Lifehttps://sites.google.com/site/indigenecommunity/home/indigenous-circle-of-life represents a constellation of interactive social-economic practices for strengthening ourselves as individuals and as society. Mohandas Gandhi’s ‘Satyagraha’ (‘Truth-search’) holds key elements of these traditions. Humans are social creatures by nature, so that we exist always in relations with others mirrored to our relations with ourselves. Threats to relations cause anxiety. The good news is that we can strengthen human solidarity, compassion, nurture, and mutual-aid. 1. SATYAGRAHA Mohandas Gandhi led the way with ‘Satyagraha’, literally ‘Truth-search’ in which he advocated that we inquire with our friends and enemies as to their “best intentions” in the acts they are engaging of and how we might aid them to accomplish these intensions. Gandhi as a lawyer was trained in dialectic (two-sided) dialogical engagement and its role for humans in conflict and collaboration. 3. SOLIDARITY https://sites.google.com/site/indigenecommunity/relational-economy/solidarity Reduce back to a human scale of interacting with the world. Know that everytime we are spending a dollar or our time, we are voting and making a choice. We can choose once our basic needs are met to invest (not charity but accounted for stewardship) in the well being of each person and humanity as a whole. Just as drug, alcohol and cigarette addicts do not need their mood enhancing fixes, so each of us do not need energy, material or technological fixes to make us happy. In fact the local time, place, scale and circumstances at which we each live and even boredom, sadness and quietness are deeply meaningful and revealing to ourselves, the ecology and biosphere. Taoists have an expression called “Wei Wu Wei”, “Doing not-doing” in realising humanity’s mission on earth, being still, to allow the voice of the earth to speak through ourselves and visa versa. Not nature as a commodity, which we drive or fly to, but as a conscious being in which we are constantly immersed.